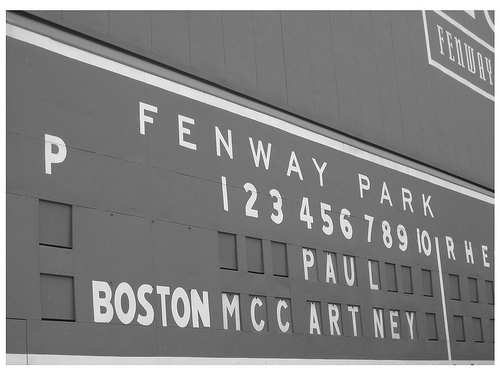 I'm super excited because in less than two months, on July 9, I am going to see one of my all-time favorite musicians live in concert: Paul McCartney! He's playing a show at Fenway Park in Boston this summer and I'll be there! Starting two weeks ago in Brazil, Paul is on his Out There tour during this summer, playing in South America, North America, and Europe. 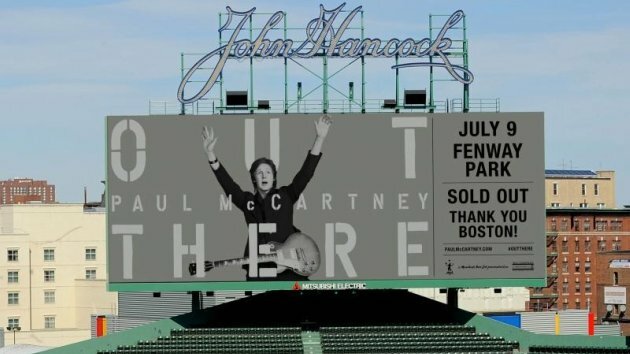 I have always wanted to go see him in concert, and he last played Boston in 2009 when he did back-to-back nights in Fenway, but I've never had a chance to go see him until now! I'll be going with my mum, who like me, is a lifelong Beatles and Paul fan, although she's been one longer than me (of course!). She and my dad remember seeing The Beatles live on Ed Sullivan in February 1964 when they made their American debut and have been fans ever since. For me, I remember hearing them on the radio and on my parents' records and tapes since I was a little kid, and I became a full-blown fan (as you know from posts HERE and HERE elsewhere on my blog) for life. I love all of the Beatles, and when I was younger I was mainly a John fan, but as I've gotten older and learned more, Paul became my favorite, hands down, for a variety of reasons. The main reason is because of his songwriting talent (although I think John and George's songwriting is spectacular, too) and also because of the fantastic work he's done since the Beatles' split in 1970. I'd long been a fan of his first two solo albums, McCartney and Ram (which is one of my favorite albums of all-time and will probably be the subject of a future album review blog post), but recently I've been going through his entire solo catalog. I was peripherally familiar with his Wings and solo material, mainly through what's been on the radio, but over the last year I've gone through every album he's made since 1970 and found that I love it all. Wings (1971-1981) was a *GREAT* band with so many wonderful songs and album, and if you get past the narrative that's been accepted as the conventional wisdom as written by critics over the last 40 years (saying that Wings was "soft" and "soppy" and "lightweight"), you realize that it was some of Paul's best work and, while not up to the lofty and unattainable standards of The Beatles, it's not far off. After Wings disbanded in 1981, Paul embarked on a true solo career that has been equally as spectacular and successful and spanned a slew of different styles. There are obvious weak spots in his discography as there are with anyone (no one is perfect...well, maybe The Beatles...) but overall it's chock full of more great songs and albums. Again, that's probably a subject for a future blog post...in fact, I'd almost guarantee it! 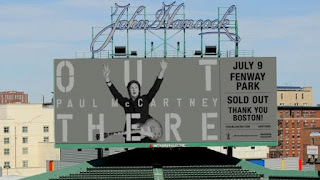 Lastly, Paul will be 71 by the time I see him perform in July (his birthday is in June), and by all accounts he still puts on a wonderful concert. I've watched some YouTube videos of his first shows in Brazil and Florida from this tour, and while his voice is not as strong as it was when he was younger, he still sounds great and sings all of the songs in their original keys, unlike many other bands who have to lower the keys to accommodate their diminished voices (such as Billy Joel, Elton John, Roger Daltrey, Robert Plant, etc). It's also been nice to see Wings getting the acknowledgment they deserve as a great band, through fans old and new speaking up as well as the new Paul McCartney remaster series and the release of the Wings concert film Rockshow on DVD, Blu-Ray, and in movie theatres this summer. 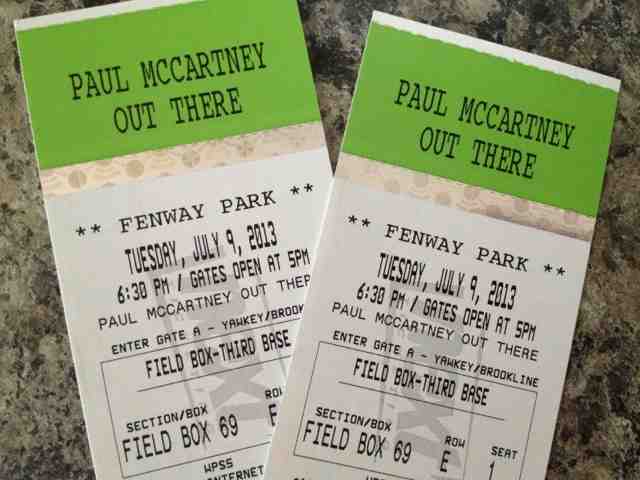 Below are my tickets...I can't wait to go into Fenway for the first time as a concertgoer (I've seen loads of Red Sox games there, but never a concert) and hear 3 hours of the songs that have soundtracked my life, sung and played by a living legend, one of my musical inspirations, and a member of the greatest band of all time. It's going to be great!